Make buying adult diapers and incontinence supplies private and convenient. Order the leading brands you already rely on or explore new incontinence products that can better serve your needs from well-known names like Depend and Attends and innovative premium brands like Tranquility, TENA, Unique Wellness, and FitRight. 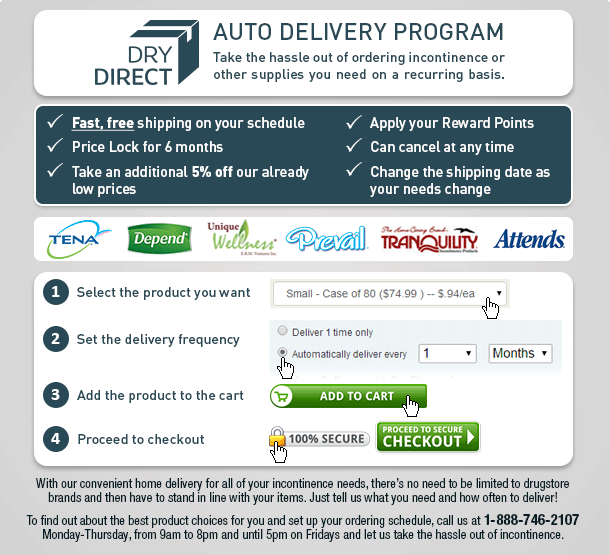 With our convenient home delivery for all your incontinence needs, there's no need to be limited to drugstore brands and then wait in line with your items. Just tell us what you need and how often to deliver! To find out about the best product choices for you and set up your ordering schedule, call us at 1-888-746-2107 Monday-Thursday, from 9am to 8pm and until 5pm on Fridays and let us take the hassle out of incontinence. What is the "Low Price" Lock in? This means that your price will not go up for 6 months. And the good news is that if our price goes down then yours does too! Do I get Free Shipping and5% Off if my order is under $75? Yes! When you sign up for our auto delivery program you get Free Shipping and 5% off any order. What if I set up auto delivery, but then no longer need the products? That is no problem. You can cancel your auto delivery at any time for any reason. How many reward points can I apply to a Dry Direct order?